I’m getting concerned. No one has submitted a list of movie monsters that are bomb-related. Is anybody out there working on this? Is this contest to name enlarged movie creatures due to man’s folly going to flop? Now Bradley has not named the monsters in question for his first two entries. Seeing as how I’m completely unfamiliar with the “Horror of Party Beach” — which seems like a must-see movie — I’m at a loss to know the creature. I’m beginning to think this creature does not have a name. Or a nickname. Come to think of it, the beast from 20,000 fathoms probably didn’t have a name, either. Godzilla is the exception to the rule. And maybe his real name was different. We just don’t know. So I think I need to change the rules of this contest on the fly. Just list the names of monster movies built around creatures with plot lines related to the Bomb. And if the creatures have names, then by all means list them, too. We could use this as a tie-breaker. Or something. Hmmmm. I will be the first to admit that this contest was poorly conceived. Sometimes group think really is better than solo excursions. If I change the contest to naming movies built around bomb-generated creatures, including creatures with no names, then I have to allow sequels, and sequels to sequels. So be it. For franchises, it’s OK to list separate movie titles. Extra credit for listing creatures with names or nicknames. These contest rules are subject to change. So how does this work? If we submit our lists as comments, will you simply not approve the comments until the end of the contest, to keep the lists hidden? Please confine your lists to monsters, not monstrous humans. But how do we know what Godzilla’s real name was? It could have been Bob, or Mark. Godzilla used body language, quite effectively. There was no doubt that this lizard/gorilla could get his points across. But he never left a business card. –From the internet movie database website. —If “rhedosaurus” is a fictional species name, then do the words “the rhedosaurus” count as a name? Creative mind meld from the arctic to the Bikini Atoll. As I recall, the “rh” of rhedosaurus actually stands for Ray Harryhausen, who did the special effects for that and so many other classics. “The Beast from 20,000 Fathoms” was always a favorite of mine, but I don’t recall any bomb connection. Maybe “The Giant Behemoth,” a lesser attempt by the same director about a radioactive dinosaur. Another favorite was (is) “Them,” about ants that grew to giant size because of the bomb tests at White Sands. Then there is “Beginning of the End,” which is about giant grasshoppers (and stars Peter Graves, the brother of James Arness, who starred in Them), but, alas, “Beginning of the End” is no “Them.” “The Amazing Colossal Man” was also the result of atomic testing (but not the Attack of the 50-foot Woman, who had some sort of alien encounter). Human monsters like Dr. Strangelove do not count. But movies about humans who get transformed into creatures as a result of Bomb-related plot lines do count. How about monstrous machines that only look human? E.g., the robots/cyborgs in the Terminator films. According to the background plot, in the future a really clever machine starts a nuclear war and also creates terminators whose mission is to kill humans. In the films, one or two of these terminators arrives in the past via time travel with programmed instructions to kill one or two specific individuals. It’s a stretch, but I’m OK with adding movies with cyborgs, as long as there is a nuclear angle. 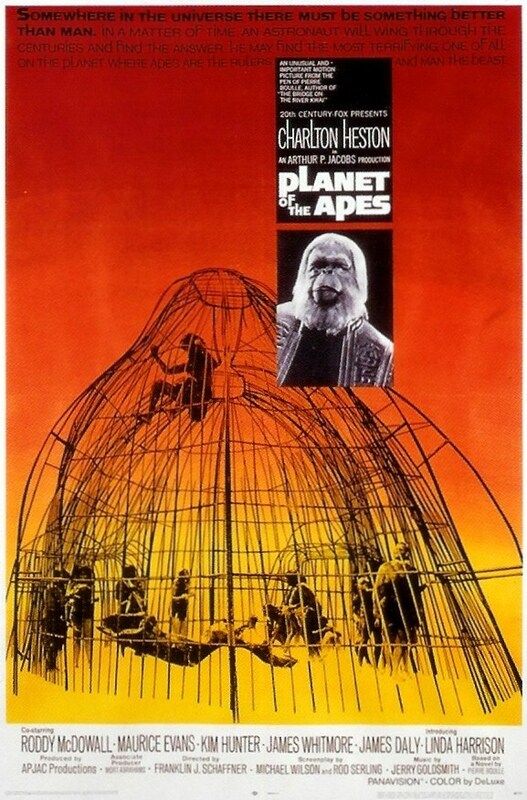 The poster of the “Planet of the Apes” movie, courtesy of Josh Pollack, heads in this direction, too. What about Spiderman? [70s tv show/movie],that was a radioactive spider that bit him. I just assumed somebody would submit the mutants worshiping nukes in St Patrick’s NYC “Beneath the Planet of the Apes”. And they had a most excellent palimpsest (of sorts) of prayers. Sister computers Colossus (US) and Guardian (USSR) tasked with nuclear security team up to take over the world from the humans. Remarkable about the film is the technical accuracy and filming of the computer control center location at the UC Berkeley Lawrence Hall of Science. It is still accurate and uniquely powerful after all these years.